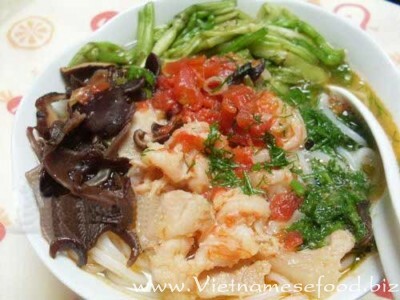 Shrimp noodle or shrimp rice pancake are famous dishes of Hai Phong. 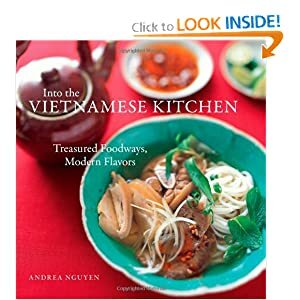 Today, welcome mothers to test with delicious shrimp noodle dish (Bun tom Hai Phong)! - Wash celeries, cut up them into pieces about 4cm long, dip through hot water, and separate them. - Take the head and shell the shrimps, and put them in separate. Pull out the black thread at the shrimp’s back. - Slice the meat into thin pieces large in width. - Soak job’s ears and field mushrooms until rising, wash and slice into pieces about 1cm thick. - Dip rice noodle through hot water and separate it. - Add them into a bowl of water then filter them slowly. - Continue to add other 1/3 of onions , add meat and fry them in about 2-3 minutes for less fat, add more spice for strong flavour. - Use the pot that fry meat before, add field mushrooms and fry with a little sauce in about 3 minutes, then take into a bowl, then separate it. - Add the last 1/3 of onions to a pot and fry them, add tomatos then stir until they’re flaccid, after that add the bowl of bone soup and the bowl of filtered shrimp soup and boil it, then taste for pleasant. - Pay attention to taste this soup so that it’s more a little bit tasteless than your normal taste because shrimps and meats were salt. - Now you just need to add noodle to bowls, put celerys, shrimps, meats, job’s ears and dills then souse soup on them. 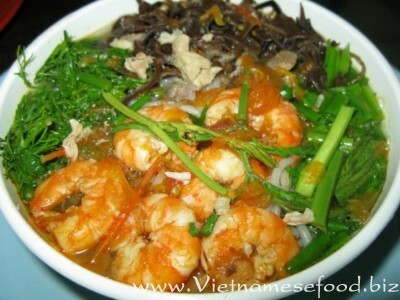 - A bowl of hot and delicious rice noodle with the strong soup of shrimp flavour and crisp celeries will certainly satify members of your family on the weekend! In addition, you can also use rice pancake instead of noodle.